I'm a big fan of dressing my kids for holidays, but I like to buy styles that can be worn any time of year. Valentine's Day means lots of love hearts, red and pink - all styles that can be worn year round with a little mixing and matching. Aren't these just the sweetest little shoes? Perfect for Valentine's Day or any time of year. They come in gorgeous colors but poppy is my favorite. They also come in a gender neutral lace up oxford style. This gender neutral beanie is perfect for any day of the year that calls for keeping you noggin warm! My favorite thing? It comes in both adult and kid sizing for twinning with your littles! My go to basic dress for my girls! Like everything from Primary, this dress comes in a great range of colors with sizing up to 12 years. This raspberry color is perfect for Valentine's Day or any day for your pink loving kiddos. 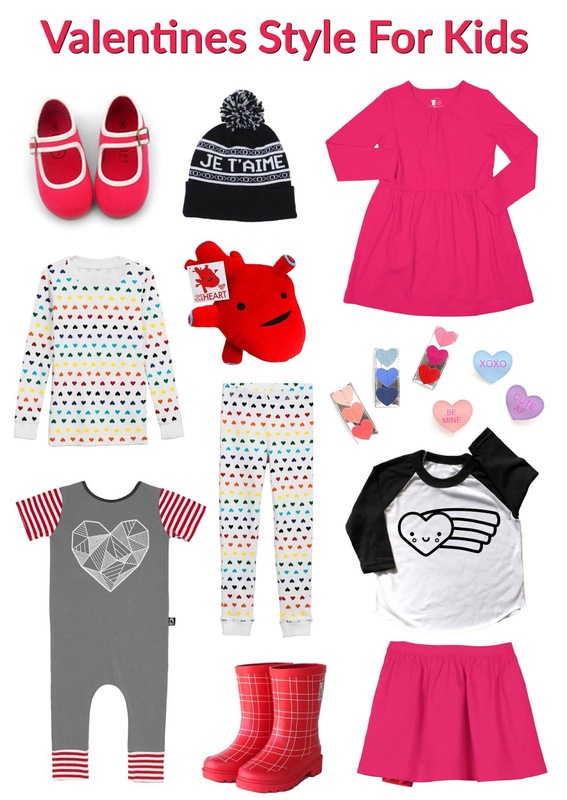 Primary pajamas are my go to when it comes to costume bases for Halloween (you can see how I've used them here and here) and with this new rainbow heart design they're now my favorite for Valentine's Day too! Ok, so this one isn't something to wear, but I couldn't resist this super cute plush heart. It may not be a love heart, but I still think it makes a cute Valentine's Day gift. There's a whole range of organs available. I bought Mathilde the plush tonsil after she had her tonsils out a few years ago and it's one of her favorite toys to cuddle. Hello Shiso is my go to brand for hair accessories for my girls. The cute designs are perfect for any occasion and they make the most adorable gifts. If you've been following Little Hiccups for a while you're sure to have seen Mathilde wearing Rags rompers before. They're such an easy all in one outfit to throw on, they're super comfy and they come in great designs that are just a little off beat. This heart romper is perfect for Valentine's Day. It also comes in a matching t-shirt. How cute is this kawaii heart graphic? This baseball style t-shirt is perfect for year round wear and I love the simple styling. I comes in tiny baby sizes all the way up to size 12 which makes it perfect for twinning siblings - which you know I'm all about! Valentine's Day falls at a particularly rainy time of year here so rain boots are a must. Actually, these boots are so cute I think they're perfect to wear all year round. This red color looks great on both boys and girls, and is sure to make every outfit look cute! Sometimes you just can't decide between pink or red for Valentine's Day, so why not go for both with this fun reversible skirt? These skirts are great for twirling and they're perfect for every day wear. I hope this provided you with some fun inspiration for Valentine's Day!